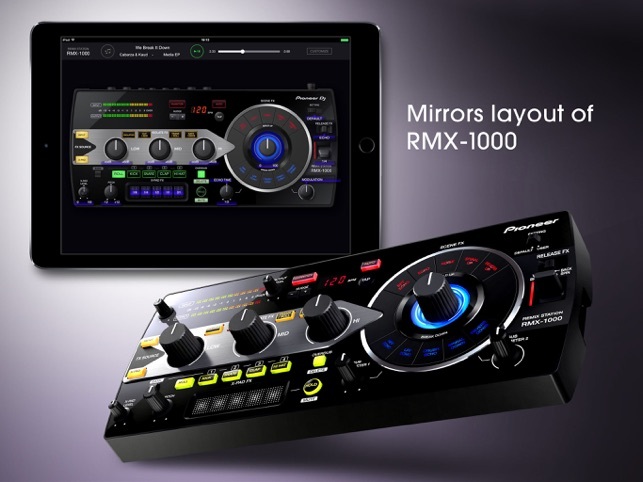 RMX-1000 for iPad is a tactile iPad app that lets you add high-quality FX to tracks in your iTunes library. This app really comes into its own when linked to the Audiobus*2 app and Inter-App Audio, which will let you add FX to music you’ve made on your iPad. Launched in 2012, the RMX-1000 hardware is a hugely popular effector that can be used in the studio and for DJ performances. 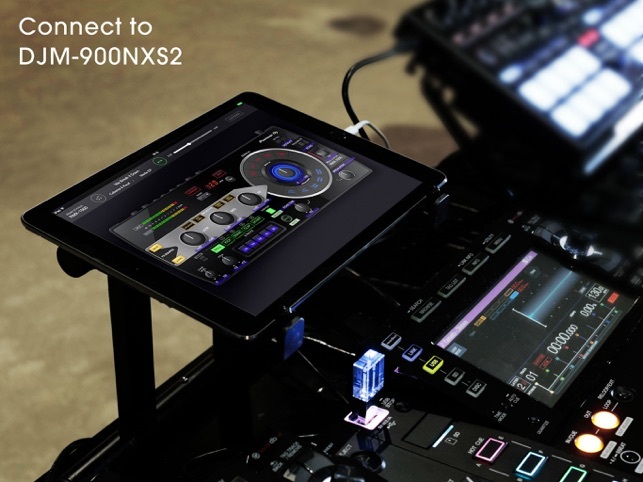 The RMX-1000 app emulates the hardware to deliver touchscreen control of Scene FX, Isolate FX, X-PAD FX and Release FX. 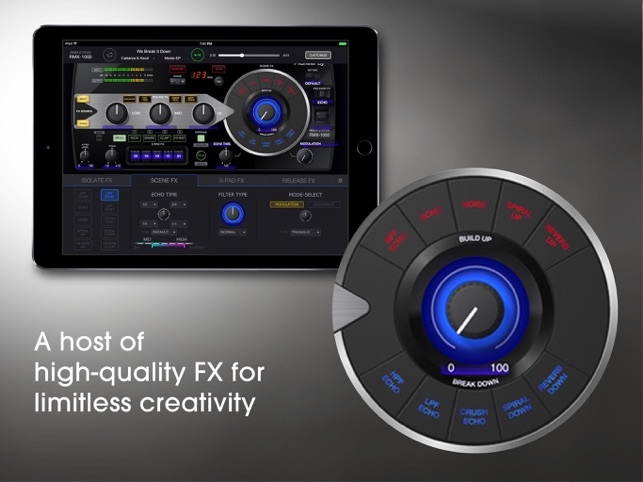 Just like the RMX-1000, the app lets you customize the parameters of the FX to create your own unique sound. X-PAD FX: Trigger pre-assigned samples in time with the BPM and use the X-PAD to repeat samples at different speeds. SCENE FX: Build up and break down tracks by combining ten types of FX. RELEASE FX：Exit the original track and feature complex FX combinations – or return to the music instantly. ISOLATE FX：You can arrange the sound by adjusting the Hi/Mid/Low-frequencies with three types of FX and ISOLATOR. Create unique sounds and experiment with your own style. 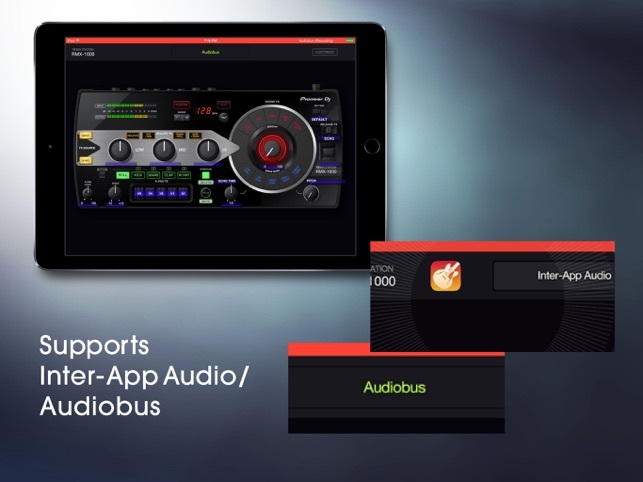 ◇ Remix play with high quality audio is available when your iPad is connected to the USB-A port of a compatible DJ mixer*3 using a Lightning-USB cable. 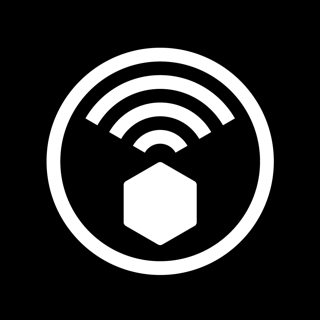 This application supports Quantize feature when CDJs and DJ mixer (both supporting Pro DJ Link feature) are connected via Pro DJ Link. 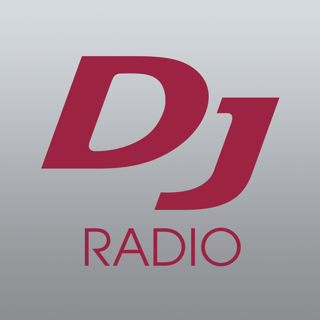 *1: DJM-450 does not support charging capability for iPad. *3: Compatible DJ mixer: DJM-900NXS2, DJM-TOUR1, DJM-450 and DJM-750MK2. - DJM-TOUR1/DJM-900NXS2: SEND/RETURN did not work on rare occasions when the mixer was connected. - DJM-TOUR1/DJM-900NXS2: Audio from MIC was input to iPad/mixer for a moment when the mixer was connected/disconnected. 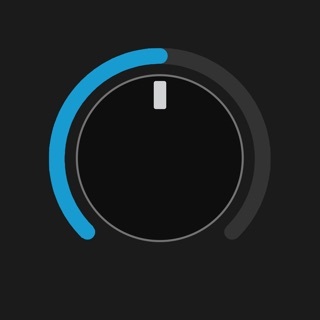 - Threshold value for Level Meter lighting. - Improved stability and fixed other minor issues. I love this app. It has convinced me to buy an rmx-1000 for real. The drawback is the auto sync simply does not work. It doesn’t even work for techno and minimal with pronounced 4/4 time signatures. Come on a Pioneer? You can do better than this. I’m a DJ and really want this to practice with. Even the tap tempo doesn’t work. I can tap a consistent tempo and it jumps all over the place. Barring that I love the app and effects. As a long time user of pioneer gear, this app made my day. I do believe this is the first time often imitated Pioneer FX have made it on the ipad. This is the real deal. My only gripes are with GUI. Although true to the hardware, 1/4 of the screen is wasted on blank space. The buttons are so tiny, which might be hard to use at a gig. The app could also use midi mapping of the knobs and buttons, audio in/out directly from the app, and the ability to load user samples. Requires iOS 8.0 or later. Compatible with iPad Air, iPad Air Wi-Fi + Cellular, iPad mini 2, iPad mini 2 Wi-Fi + Cellular, iPad Air 2, iPad Air 2 Wi-Fi + Cellular, iPad mini 3, iPad mini 3 Wi-Fi + Cellular, iPad mini 4, iPad mini 4 Wi-Fi + Cellular, 12.9-inch iPad Pro, 12.9-inch iPad Pro Wi-Fi + Cellular, 9.7-inch iPad Pro, 9.7-inch iPad Pro Wi-Fi + Cellular, iPad (5th generation), iPad Wi-Fi + Cellular (5th generation), 12.9-inch iPad Pro (2nd generation), 12.9-inch iPad Pro Wi‑Fi + Cellular (2nd generation), 10.5-inch iPad Pro, 10.5-inch iPad Pro Wi‑Fi + Cellular, iPad (6th generation), iPad Wi-Fi + Cellular (6th generation), iPad Pro (11-inch), iPad Pro (11-inch) Wi-Fi + Cellular, iPad Pro (12.9-inch) (3rd generation), iPad Pro (12.9-inch) (3rd generation) Wi-Fi + Cellular, iPad mini (5th generation), iPad mini (5th generation) Wi-Fi + Cellular, iPad Air (3rd generation), and iPad Air (3rd generation) Wi-Fi + Cellular.